Providence’s Runway 5 Extension at T.F. Green Airport (PVD) has received the Envision Gold award. Operated by the Rhode Island Airport Corporation (RIAC), the project is the 16th overall Envision-rated project and first project rated in Rhode Island. The lengthening of T.F. Green’s main runway to 8,700 feet is part of a multi-year Airport Improvement Program to accommodate aviation activity demand and enhance the safety areas. The extension is also designed to improve flight efficiencies through increased payloads and reduced weight penalties, and to accommodate long-haul service to the West Coast. The project recently began construction and is expected to conclude by December 2017. Sustainability was identified as a main objective at the design stage, which was led by C&S Companies. The project effort began with an integrated sustainability design that involved a cross-section of RIAC representatives. Participants worked together to identify sustainability priorities, as well as the unique challenges and opportunities related to the Runway 5 Extension. Potential sustainability initiatives were generated and assessed to provide informed recommendations that would contribute to RIAC’s objectives and the project’s success – both in construction and for the long term. As Green Airport’s main runway, RIAC recognized the importance of balancing first-time costs with continued durability, resilience, operational efficiency and environmental stewardship. This progressive outlook and RIAC’s commitment to the surrounding community led to the decision to embrace the Envision rating system. Quality of Life (QL): In addition to the benefits the project offers to the local economy through job creation and expanded accessibility to the region, RIAC and the project team have undertaken efforts to invest in the local human capital. Partnerships have been established with local schools and educational institutions, and the construction manager has engaged several job shadows to help students learn about the opportunities that exist within aviation. Given the existing and projected shortage of aviation professionals across the country, this will not only be impactful to the workforce around Providence, but will also fill a broader void within the industry. Resource Allocation (RA): During the design, participants identified resource conservation – specifically of energy and materials – and the reduction of maintenance and operating costs as major priorities. The project team and RIAC collaborated to identify the most efficient measures for achieving these objectives. As a result of this dialogue and follow-on efforts, a proposed hold bay (which is a pavement area near the end of the runway for use by aircraft waiting to take off) and a taxiway connector were omitted from the project scope, resulting in cost savings both initially and in the long term related to continued maintenance of those pavement areas and operational costs associated with lighting and signage. Combined with the use of LEDs, these efforts to minimize scope will result in a 34% energy reduction. The reduction in pavement also provided benefits to many of the Natural World (NW) credits such as managing stormwater, due to the reduction of impervious surfaces. Climate and Risk (CR): The Runway 5 Extension and its related systems were designed to be resilient and adaptive to changes under altered climate conditions. Due to the runway system’s need to remain operational at all times and avoid disruptions to aircraft activities that can have major economic impacts, the team evaluated the existing lighting cables and determined that replacement will increase the resilience of the project. The runway extension by its nature will also allow PVD to adapt to changing conditions since aircraft will be able to continue operations during increasingly frequent and more intense heat waves (aircraft require additional runway length to take off at higher temperatures). For more information regarding the T.F. 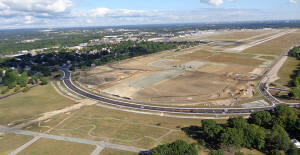 Green Airport Runway 5 construction, see http://www.pvdairport.com/corporate/construction. Photos and additional details regarding the Runway 5 Extension can be found at: http://www.cscos.com/2016/07/t-f-green-envision/.